This is a theme for those of us that want something simple that just works. 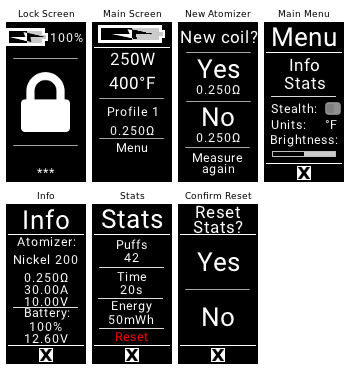 There's no endless graphs or settings to tweak, just a simple vaping experience. It still supports Replay, temp control, wattage mode, etc. Just less of the extra junk. Check out my other theme if you want something more full-featured. Note: The screenshots above are somewhat misleading. 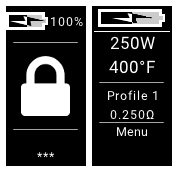 The battery icons only show lightning bolts when the device is charging. See screenshots below for the normal screen. Replay info: This theme works with Replay for 75c devices (250c can do Replay by default). BUT you need to have the International Edition of EScribe 2.0 SP15.1 or later. Your 75c needs to have the right firmware as well (at least 1.1 SP33.2 - that one works for me), once you update ESscribe and connect your device it should prompt you to update firmware. You also MUST enable Replay in your EScribe profile for it to work. Using replay: Once the above has been completed, load this theme and switch to a replay-enabled profile. There should be a "NO REPLAY" button seen on the main screen. This means there aren't yet any puffs to save. So take a few puffs, until you find one you like. Then the button should change to "SAVE," and you can click that to save that latest puff. Once Saved, the button changes to "PLAYING." Click that if you want to end Replay. Let me know what you think! Please leave suggestions, improvements, or bugs in the comments or reviews. Thanks! Also added SUPER SIMPLE version. This is JUST the main screen. You can change profile, adjust wattage, temperature, and enable Replay. That's all you really need, right? A very clean, simple and easy to read theme. Sometimes it's the simple things! Great work.